What a weekend that was. 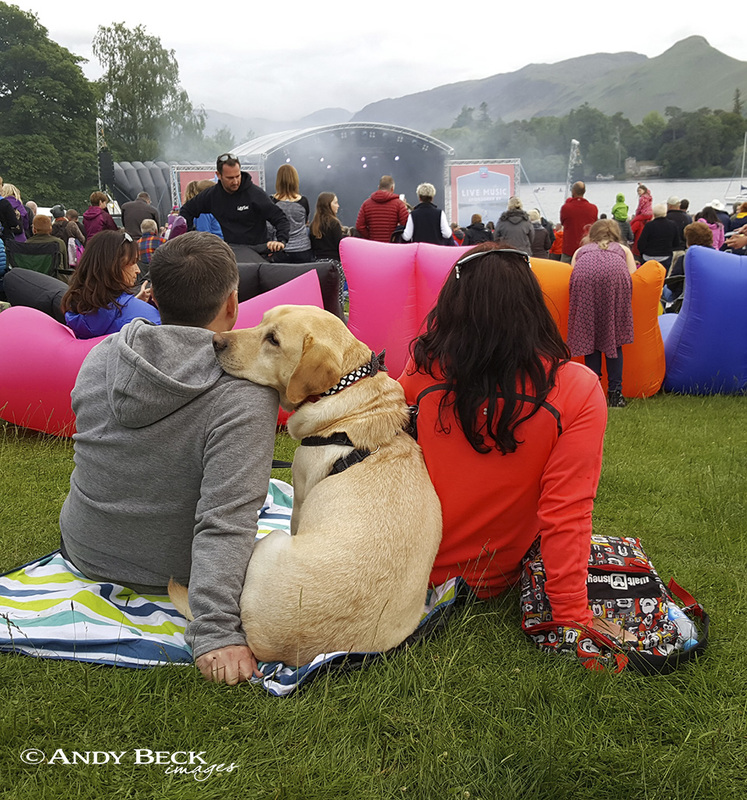 As often happens in the Lake District the weather played a major part in the plans for the Keswick Mountain Festival three day event. 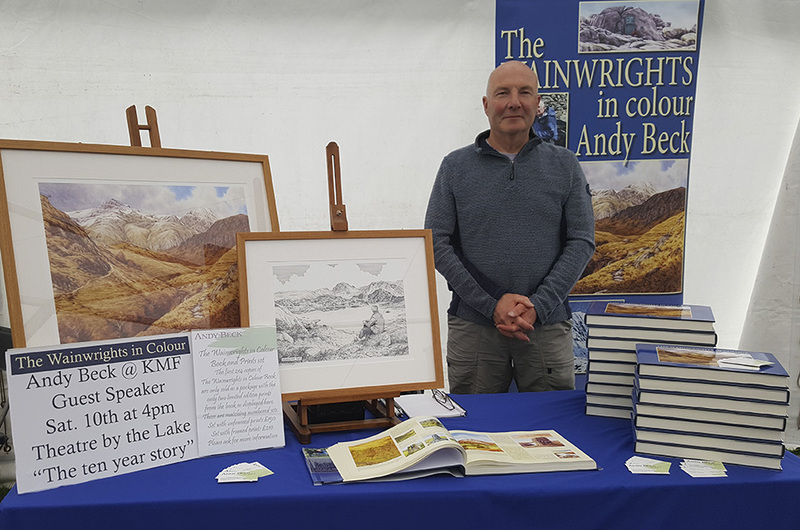 As I was asked to be one of the main speakers on the Saturday afternoon we decided to use the event to promote the book so we had a small exhibition space in the retail marquee on the site. Setting up on the Thursday afternoon was fun, recent rain had left the ground a bit soft to say the least so getting the stock to the final location was a challenge but we were all ready to go by opening time on Friday, a mostly dry day but breezy. Not the day of crowds but still a good number of visitors who were able to ask the questions about the book and thumb through a sample copy. Sales were made. 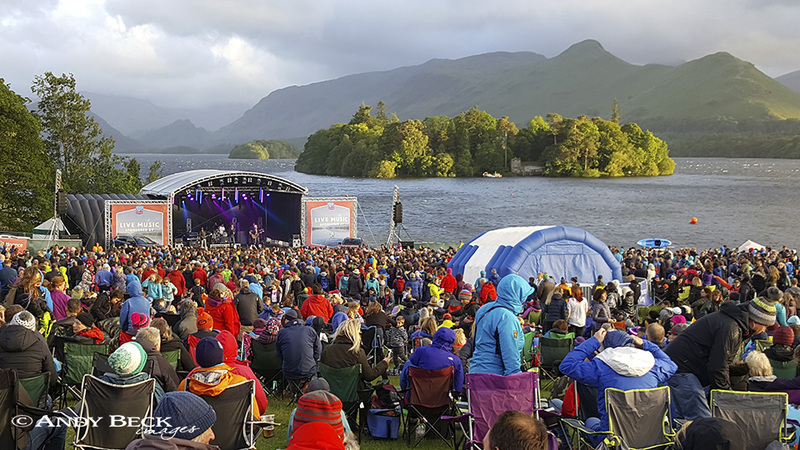 As well as outdoor activities and sporting events the festival is also a music event on the evening so Friday night we joined the crowd to watch The popular Peatbog Faeries . Saturday was a much busier day, not only for the increased number of visitors but also for me. 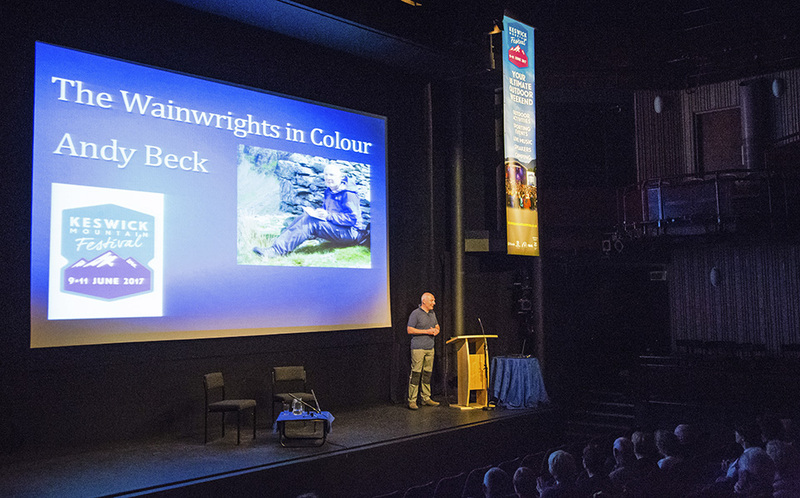 The honour of being asked to give a talk on the main stage at The Theatre by the Lake didn’t daunt me too much but my concern was as to whether anyone would turn up to listen to me, after all, I am no Chris Bonnington or Alan Hinkes (the other speakers on the day) but I am just a guy who has walked the fells for 10 years in pursuit of completing my own personal challenge. 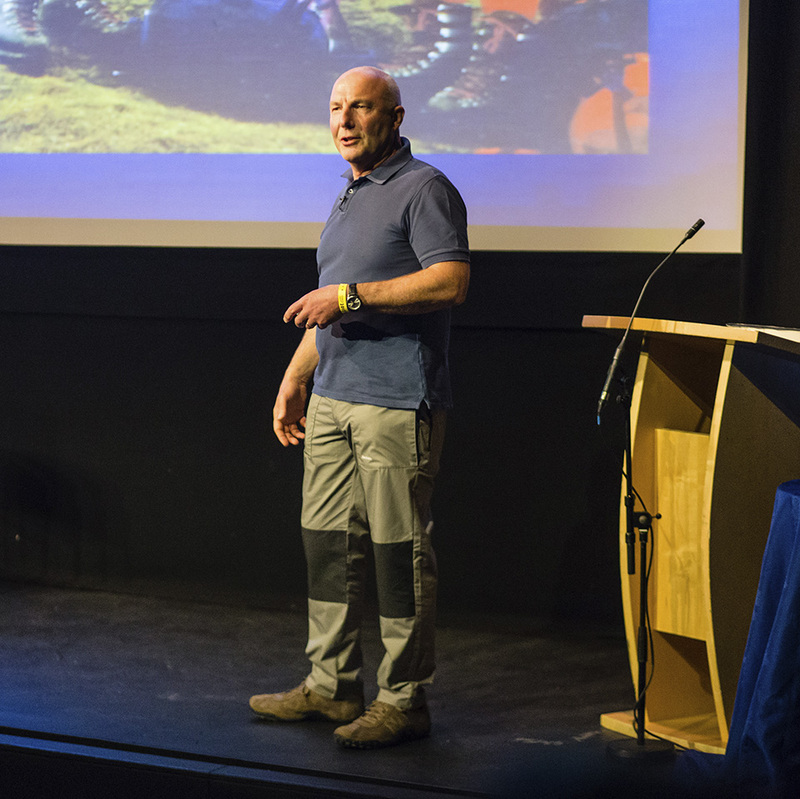 I needn’t have worried, as I was introduced onto the stage by Simon Ingham, the editor of Trail Magazine I could see that a good number of people were waiting expectantly to hear my story. My 45 minute presentation seemed to have been received rather well and this was followed by a short question and answer session. I love telling my story and hopefully my passion and love of the task comes over in my talk. The following day was “all change”. The weather overnight had taken a turn for the worse, the breeze had developed into more of a strong wind, some of the smaller trade tents have blown over and more rain had fallen. Due to health and safety reasons the main event site was closed down, no access to anyone, we were not even allowed to check out our stock. Time to made alternative plans. It would have been easy to have just thrown but I was there in the town so why not make use of one of my book stockists? So it was that I persuaded the team at George Fishers to give me a table and a bit of space inside their store. By opening time we had set up a simple sales area and for the rest of the day I was able to meet and greet at least a few of my customers who were taking shelter from the weather by visiting shops in Keswick. It turned out to be a good day for book sales even though these books were from the shop stock and not mine, still a sale is a sale. We stayed in Keswick an extra night and by the Monday morning we were allowed to gain access to the site and recover all out stock and items from the marquee, thankfully without any damage. So to say it had been an eventful weekend would be an understatement but enjoyable and tiring at the same time. Roll on the next event at The Witham on the 27th June.